There are several known legends of water dwelling monsters in Scottish, Irish and Pictish history. Saint Columba's experience may boil down to how ancient cultures in the area described animals at the time, even if those creatures seemed to only exist for mythological purposes by modern science. Two such creatures exist in Pictish folklore evident by symbols found in their ancient stone carvings. One resembles the shape of a dolphin, dragon, horse or elephant and is popularized today as the Pictish Beast. The other is the Water-horse, or highland bull, claimed to haunt pools and lochs to lure children to their deaths. 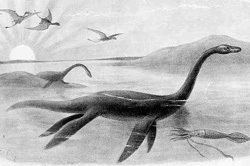 In both cases we find distinct features which could match up with Columba's encounter to suggest it might be a play on folklore for the benefit of an Evangelistic journey, but nothing quite specific enough for plausible identification of a past Nessie relative. Both Irish and Scottish lore talk of similar beasts, namely the River Wolf, Water Hound, Irish Crocodile, and Dobhar-Chu. Although these animals are traditional described as half-dog half-fish, they eerily fit along with Columba and some Nessie descriptions.